Hi there folks, as you may know I usually post in Spanish here but I´m writing this in my rusty English so it hopefully reaches a bigger crowd as Semrush is a worldwide well known tool. Our friends at Semrush have just silently released a cool new feature that completes the circle for our favorite and affordable SEO Swiss Army Knife. This exciting new functionality is currently in beta but it´s already a completely working tool that can be very helpful when checking the onpage SEO health of your or your client´s sites, it can be used for free although, in this case, the number of crawled pages is limited to 200. If you are under a Pro Plan the current crawling limit is 50.000 pages that you can freely divide among your different projects, 100.000 and 200.000 crawled pages are the limits for Guru and Enterprise plans respectively. Notifications: the tip of the onpage SEO iceberg, things like long URL, external or internal links using rel=”nofollow”, etc. There are tools currently available in the market to address these crawling audits. Search Engine proprietary tools: such as Google Webmaster Tools where as the owner of a given site you can access crawling data and errors googlebot detects. There are also a myriad of web apps and browser extensions that can provide with a quick snapshot of the SEO status of any given site. But the beauty of this is that from now on We don´t need to exit Semrush in order to run an extensive health check of a site. 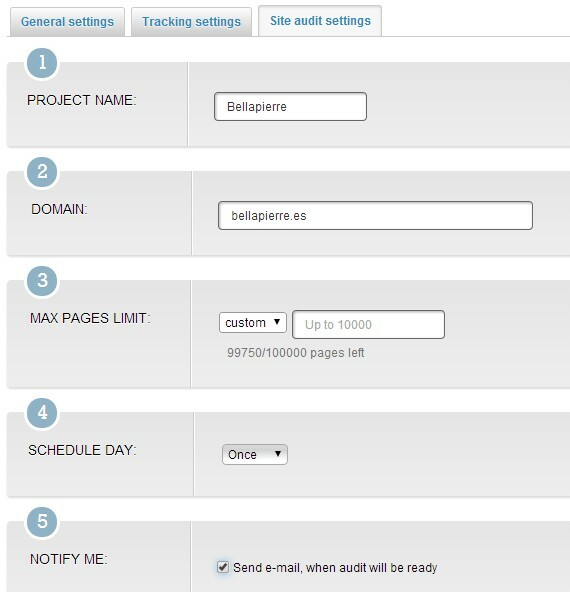 After that you can simply Create a Project and Start the Audit or you can Create and Go to Tracking Setting, if you choose this second option Semrush directs you to the also in beta “Tracking Rankings” feature where you can set a number of keywords for Semrush to track search engine rankings for those with that specific domain name. 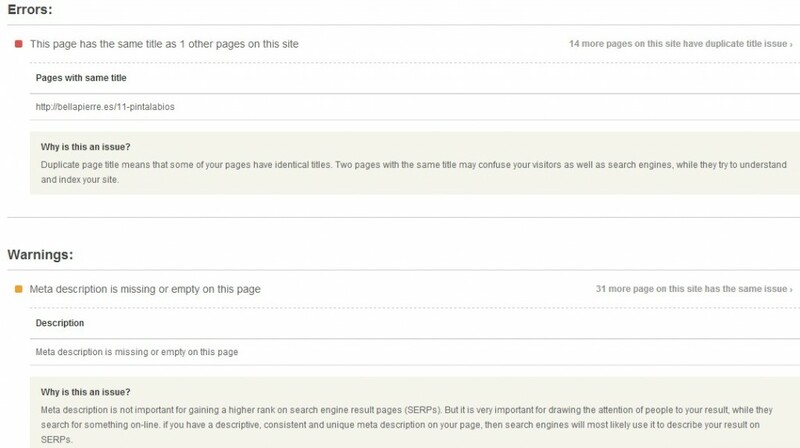 Be aware that by tying these two beta features together plus the also recent Backlink Checker, and the already existing keyword intelligence tools Semrush has always provided, the great thing about it is that you can now go through the whole SEO process for a site without ever leaving the Semrush Suite. Once the crawl is finished for your site you can access the above mentioned dashboard where you can see all the errors, warnings and notifications Semrush has detected for your domain. You can see that in this specific case Semrush has detected from 404 error pages, to broken links, to duplication issues, redirects, pages without meta descriptions, images without the alt attribute, Heading issues or even pages with a low word count. For example by clicking HTTP 4XX Client Errors I can see in this case the specific crawled pages that give a 404 error and even set filters within the interface to easily digest the information. In the detailed report tab, Semrush shows you the crawling information in a cleaner but still accessible way you can dig into. And you still have the power of a third tab in order to run a detailed health check for one specific page within the already crawled pages for a site. You can input the url or you can simply write a part of the text within a url and Semrush will give you all the urls containing that string for you to choose an specific one to run a detailed url check. 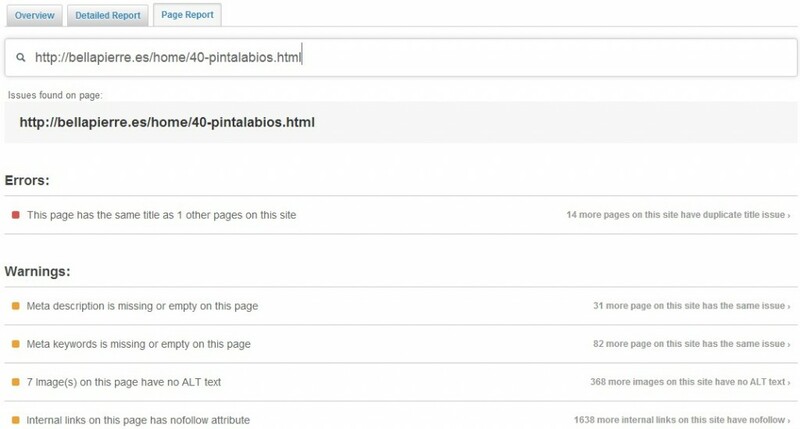 With this report you can focus on an important internal page of the audited site and the tool will present you with the specific errors it might have detected for that very url neatly presented in order of importance. And not only that, in this same report and by clicking in any of the spotted issues, Semrush digs down giving you extra information about why that is considered an error and it´s important to fix. In this case and for the input url, Semrush is telling me that this page has a duplicated title, and not only tells me why this is an issue and should be fixed but also which one is the other page within this site this page is sharing the title with and also what other pages within my site have similar issues. Isn’t that cool? 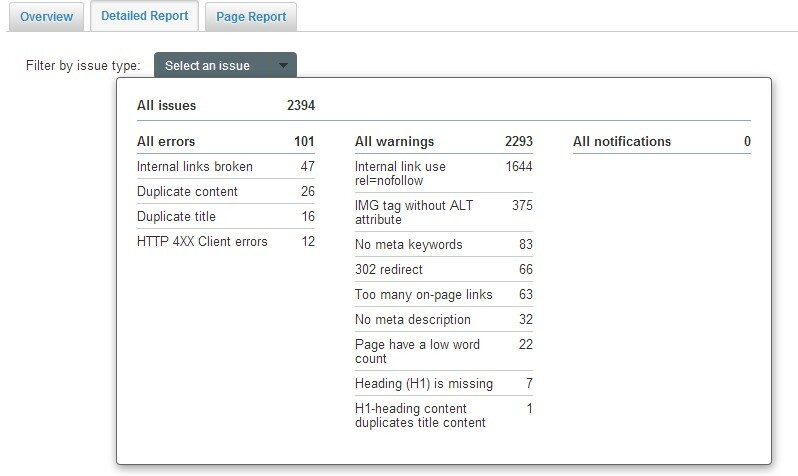 Semrush is practically doing the onpage audit for you. In my case, I must say I´m really liking what I´m already seeing and I´m grateful that Semrush is making these amazing efforts to provide SEO and SEM managers with a ton of features and a complete suite of tools that can be mixed and matched for any given project at an affordable price. In the case of this new tool and working mainly with Spanish clients I would like to see in the future a translation-localization of the interface and , most importantly, the audit results and Semrush recommendations after a site crawl. Also It would be fantastic that the audit results could be exported both in excel for further data treatment and in an already presentable PDF audit report. It would be nice as well being able to see a scorecard and a Semrush scale that could give any given site points depending on the health status of the audit. This could be a simple number from 1-100 that could became an industry standard for the overall SEO onpage health of a site. Anyway, al and all a great new feature I encourage you all to try and send them feedback. Way to go Semrush! We cannot wait to see which other features you are going to surprise us with in the near future!